For those who may wonder why posting this here, This is the man that most likely was the Guide for the Group of Seven in Algoma. He took famous American author Stewart Edward White into this area before the ACR, and was also the Guide for the surveyor crews who put the tracks in. I have been friends with the Grandson of Sidney Johnson since he gave me a lift from Hwy 17 up to Frater 10 years ago on one of my solo trips. He shared with me one of his Grandfathers drawings of the Canyon. With the people shadows I had mistakenly guessed the wrong spot but only by 200m, With out the shadows it was just another place that I had stood where Sidney painted, all very cool. 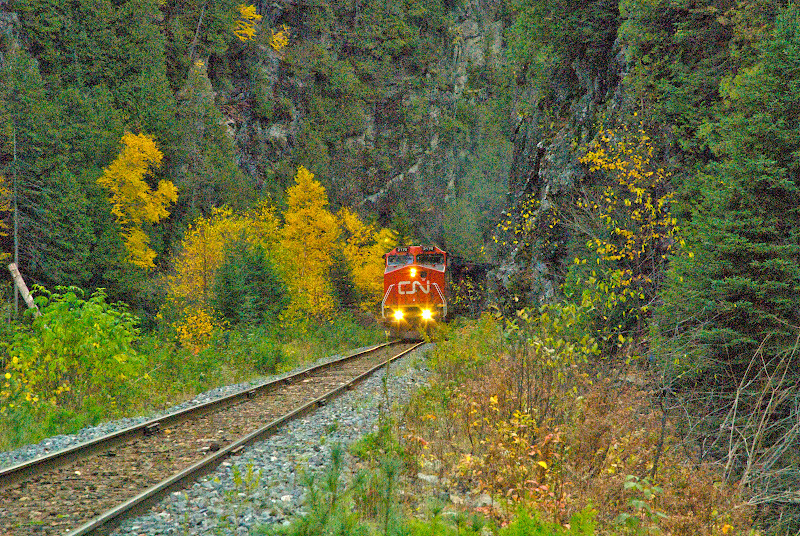 Fall trip train coming out of the sketch location. Edit And what makes it a little weird, I love walking around the canyon by moon light. It is one of the reasons I try and choose full moons for my fall trips. Last edited by jedi jeffi on January 31st, 2018, 1:39 pm, edited 4 times in total. So often, the famous are guided or proceeded by those who remain unheralded.